Buffet presentations are enjoying a resurgence in popularity. They offer convenience, choice, opportunity for personalization and dynamics to any kind of event. Thankfully, the days of long, stark tables with big silver chafers on flat, plain white tablecloths are gone. Today’s buffets are inviting, photo-worthy epicurean displays that keep guests coming back for more! Design inspiration for a beautiful buffet should begin with the menu. Is it locally-themed? Use china and cookware that is distinct and unique to the area you are honoring. In New Orleans, for example, we present some dishes in big cast-iron skillets. You can use specialty baskets, pottery, or glassware to enhance your food presentation with elements that relate to your menu items. You can also pull elements from the event’s color palette and theme to create stunning displays. Textured linens are very popular this season and have maximum effect at a reasonable cost, making budget-conscious clients happy. Floral presentations should be used with caution on food displays. They work best as centerpieces for crudité and fruit-and-cheese displays. In lieu of flowers, you might consider incorporating local produce or other ingredients into your design to liven up your buffet spaces. One of the biggest benefits of serving meals in buffet-style presentations is ensuring that all guests are able to eat, regardless of food preferences, restrictions, or requests. Vegetarians can enjoy food from one display without ever stopping at the carving station. Chef-manned stations allow personalization and preparation of small servings, sometimes even made-to-order. They are interactive, engaging, and accommodating of different dietary needs. 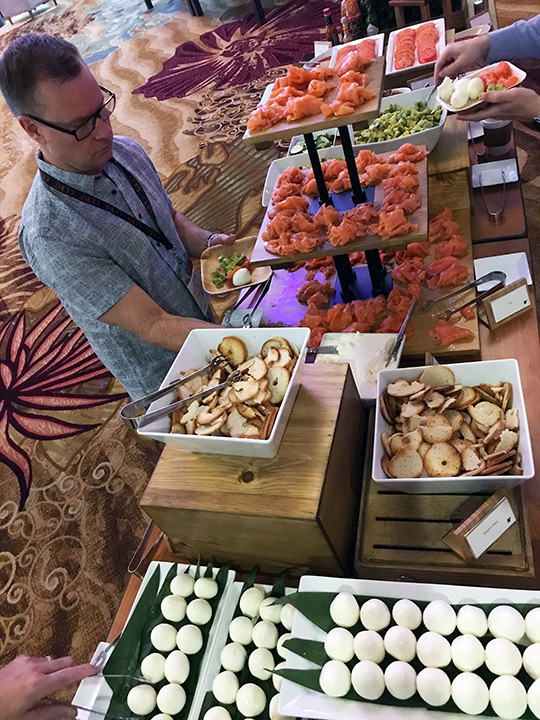 Breaking your buffet into several different stations also encourages guests to try small amounts of each menu item then return for more of their favorites, and discourages long lines. Stations are particularly helpful when you are hosting a destination event. In New Orleans, for example, our cuisine is distinct. We eat rice with everything and enjoy strong regional flavors. A buffet presentation allows us to offer these specialties while including toppings that may be more appealing to guests from other places. 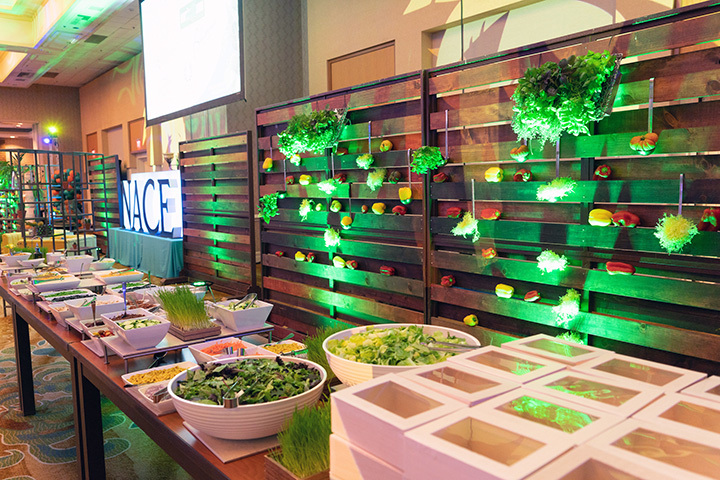 When designing beautiful buffets, food should be the star of the show, so to speak. Create stations with visual interest related to the theme of your event, the ingredients in the dishes, and with local flair. If you aim to complement and elevate your personalized menus, it should be easy to create stunning buffets.